I hated Recovery, Relapse was good but often complained about and before those was 2004’s brilliant Encore with only an EP in the form of Bad Meets Evil to keep me occupied until Eminem announced the sequel to arguably his best album, The Marshall Mathers LP. Rap sequels rarely come off better than the original, just ask Lil Wayne and his growing list of increasingly worse Carter albums, not to mention his I am Not a Human Being sequel and believe it or not, a planned Rebirth sequel. When I first heard Survival was being used as a promotional song for Call of Duty: Ghosts, I assumed it was just that and not part of his new album, but upon hearing it was in fact the lead single for MMLP2, my anticipation for the album radically dropped, until I heard Bezerk. The Rick Rubin helmed joint gave gave birth to Slim Shady’s trademark blonde hair once again and saw Eminem in his old days; going at meaningless celebrities such as ‘the ugly Kardashian’. It was a brilliant song that filled me with hope that the poppy, whiney, Recovery-Eminem was gone for good. A lot of the music on the album I was in two minds about, some were either excellent or terrible, opening track; Bad Guy and Legacy encapsulate this opinion. The (first part’s) beat to Bad Guy sounds like Bruno Mars crafted it, yet possessed a certain intrigue with Eminem’s flow reminiscing the more menacing songs from his catalogue, such as 3am or Cleaning Out My Closet but for me, it never really landed. A criticism I’ve touched upon is Eminem’s constant desire to complain, Recovery was pretty much nothing but moaning and made the album boring, much of MMLP2’s unfortunately followed in suite. However, he’s still an excellent songwriter and lyricist which, as much as I don’t want to admit it, results in quality songs like Headlights featuring Fun’s Nate Ruess. Something I was looking forward to in MMLP2 was Em’s return to production, one of the songs he produced; Stronger Than I Was also showcases his singing ability. It’s a great song filled with passion and topped off by a great concluding rap towards the end. Love Game, So Far, Evil Twin and bits of Rap God are all great and shows Eminem is still one of the best rappers in the world. In conclusion, MMLP2 was never going to live up to the reputation of being a sequel to the original MMLP. 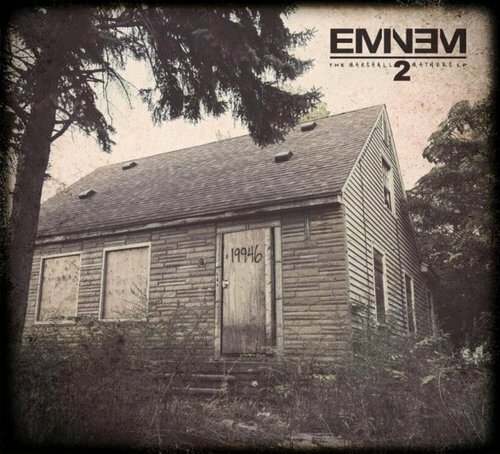 There is a lot of good music on the album, but lyrics like ‘they say I rap like a robot so call me rap-bot’, pop infested shockers like The Monster and Survival and the anticipation of it being a sequel were never going to help this into becoming a respected Eminem album.